AFC - 10/04/16 Crvena Jabuka at Veggie Picnic! The City of Zagreb, numerous animal protection associations and Animal Friends invite citizens on Sunday to a celebration of animals and vegan food, along with a concert! 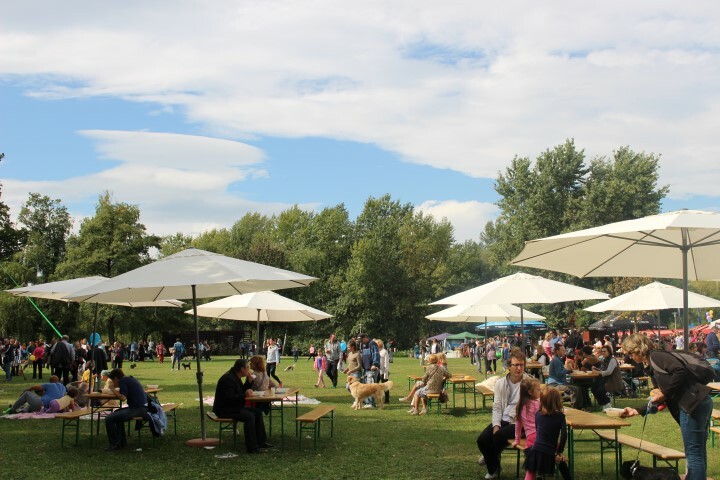 At the World Animal Day event (Sunday, October 9, 2016 from 10 A.M. to 4 P.M. at Zagreb's lake Bundek), Animal Friends and other animal protection associations will collaborate in hosting a Vegan picnic, just like in 2015. Visitors will have the opportunity to visit numerous exhibitions of vegan food and organic products, enjoying the gourmet meatless delicacies to the tune of an exciting music program, including a Crvena Jabuka concert. Visitors will be able to treat themselves to tasty vegan kebabs, sandwiches, hemp burgers, vegetable milk, falafel sauce, cevapi, tofu/seitan products and probiotic drinks, along with desserts such as cheesecakes, pancakes and fritters. The purpose is to spend at least one day consuming exclusively plant-based nutrition. Other organizations will also contribute to the World Animal Day celebration, promoting the adoption of abandoned animals instead of their purchase. The City of Zagreb's abandoned animal shelter will organize a dog adoption fashion show, giving dogs from Dumovec and other participating organizations the chance to win the hearts of visitors and remember World Animal Day as a day when they found a home. Anita Euschen, the World Animal Day (WAD) ambassador in Croatia, will be on-hand to welcome visitors and invite them to contribute towards a world free of animal violence. The mayor of Zagreb, Milan Bandic, will offer his support as well. The entire event will be accompanied by an entertainment and music program. The highlight will be a concert from pop band Crvena Jabuka ("Red Apple") -- a group with a perfect name to celebrate Veganism and World Animal Day. Everyone (with or without four-legged friends) is welcome to have a great time and find out how to help the animals on their day -- celebrated since 1931 on the day of St. Francis of Assisi, a protector of animals and a vegetarian. On the true date of World Animal Day, October 4th, Animal Friends will organize an info stall in Varsavska ulica from 9 A.M. to 6 P.M to invite passers-by to the celebration at Bundek and provide information on how to help animals. It is necessary to actively stand up for animals by sheltering abandoned animals, reporting their abuse and neglect, signing petitions, handing out flyers, volunteering in animal rights and protection organizations, using products that are not tested on animals, wearing garments from non-animal materials and switching to vegetarian or, better yet, vegan diets.